B. Hijaby Hijabs are eclectic and beautiful. Perfect for the hijabi who wants to stand out! One thing that I noticed with shopping online for my hijabs or modest clothing is that there is always a personal touch when it comes to what you order. These businesses take time to pack your items nicely and send you a personal note, or slip in just a few extras like hijab pins. 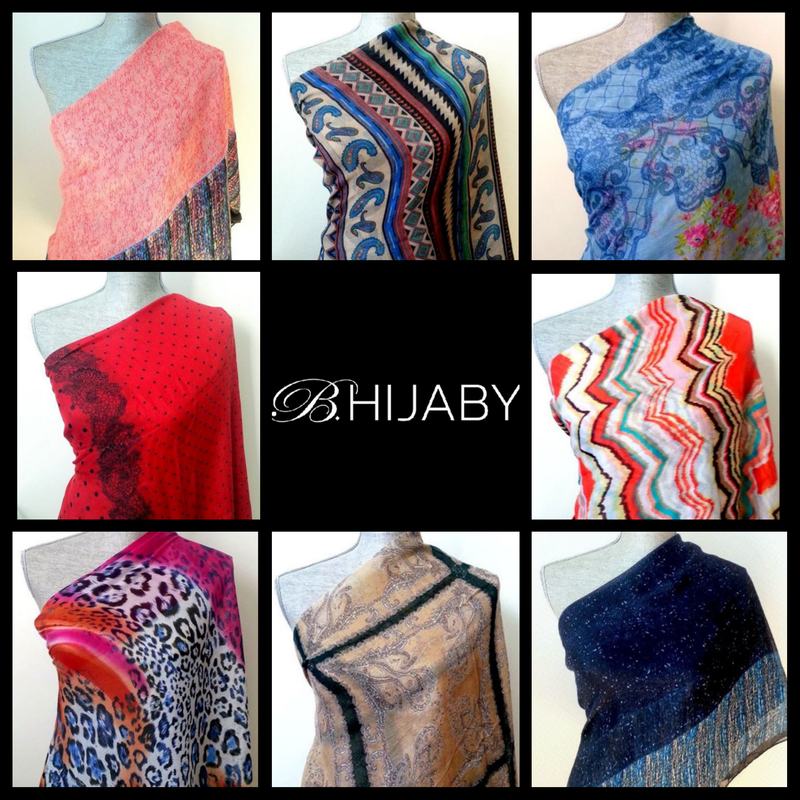 One such online hijab destination is B. Hijaby. The owner of the company, Asima Bhatty strives to provide hijabis an eclectic mix of hijabs that you can’t find anywhere else. In fact, she just launched a new collection of hijabs that you need to check out! Her hijabs go beyond the average hijab. B. Hijaby hijabs are wider than most hijabs; which allows you to create intricate folds, create cool turbans, or just give you more coverage in the front. Let’s be real, we can appreciate coverage in the front when possible! A distinguishing factor of the hijabs from B. Hijaby is that the patterns on the hijabs are unique and regularly replenish their stock. You can be rest assured that when you wear a hijab from B. Hijaby, that your hijab will not be gracing another hijabi at your local masjid (that is until you share your shopping secret with them!). I actually had an instance where I wore a hijab from Target and my husband could not find me because there were 4 other women wearing the same hijab! Online Browsing: B. Hijaby is sold through a Facebook page, so browsing is a bit more challenging than a traditional website. That being said, it is easy to look through all the albums to see all of the hijabs and prints since all of the prints are true to the image. Since they are planning to launch a website, I expect shopping and browsing for hijabs online for this brand will be easier in the near future iA. Also, did I mention the scarves are so affordable? I can see myself buying a ton of hijabs. Buying Experience: Since this time, the scarves were gifted, I am not able to share how the buying experience was. I will definitely be shopping here though and when I do, I will comment on how the ordering experience was! Shipping: Shipping is fast and easy. Since B. Hijaby is located in the U.S. you are sure to get your package shipped fast. Expect 3-5 days for delivery. All in all, I highly recommend this hijab shopping destination.